Cosalite: Mineral information, data and localities. From the locality at the Cosala Mine, Sinaloa, Mexico. Appears to contain Cu as an essential(?) constituent, according to Clark (1993) ("Hey's Mineral Index") and Zak et al. (1992). Prismatic . Frequently elongated to needle-like and capillary forms. Usually massive, also in radiating prismatic, fibrous, or feathery aggregates. Argentocosalite Unnecessary name for a Ag-bearing cosalite. Argentocuprocosalite Unnecessary name for Ag- and Cu-bearing cosalite. Quartz 31 photos of Cosalite associated with Quartz on mindat.org. Gold 18 photos of Cosalite associated with Gold on mindat.org. Pyrite 11 photos of Cosalite associated with Pyrite on mindat.org. Smoky Quartz 9 photos of Cosalite associated with Smoky Quartz on mindat.org. Galenobismutite 6 photos of Cosalite associated with Galenobismutite on mindat.org. Chalcopyrite 5 photos of Cosalite associated with Chalcopyrite on mindat.org. Fluorite 5 photos of Cosalite associated with Fluorite on mindat.org. Galena 4 photos of Cosalite associated with Galena on mindat.org. Lillianite 3 photos of Cosalite associated with Lillianite on mindat.org. Tetradymite 3 photos of Cosalite associated with Tetradymite on mindat.org. Genth F A (1868) Contributions to mineralogy - No. VII. American Journal of Science and Arts 95, 305-321. Lundström (1874) Geol. För. Förh. : 2: 178. Sjögren (1878) Geol. För. Förh. : 4: 107. Hillebrand W F (1884) On an interesting variety of löllingite and other minerals. American Journal of Science 27, 343-358. Flink (1886) Ak. Stockholm, Öfv. Bihang. : 12(2): 2, 6. Bancroft, Howland, (1910) Contributions to economic geology, 1909, Part I, Metals and nonmetals except fuels--Rare Metals: Bulletin 430-D, p. 151-218,: 214. Bastin, E.S., (1923) Contributions to economic geology, 1922, Part I, Metals and nonmetals except fuels--Silver enrichment in the San Juan Mountains, Colorado: Bulletin 735-D, p. 65-129, 65. Berry, L. G. (1939) Studies of mineral sulpho-salts. 1. Cosalite from Canada and Sweden. Univ. Toronto Studies, Geol. Ser., 23, 30. Palache, Charles, Harry Berman & Clifford Frondel (1944) The System of Mineralogy of James Dwight Dana and Edward Salisbury Dana Yale University 1837-1892, Volume I: Elements, Sulfides, Sulfosalts, Oxides. John Wiley and Sons, Inc., New York. 7th edition, revised and enlarged: 445-447. Srikrishnan T, Nowacki W (1974) A redetermination of the crystal structure of cosalite, Pb2Bi2S5. Zeitschrift für Kristallographie 140, 114-136. 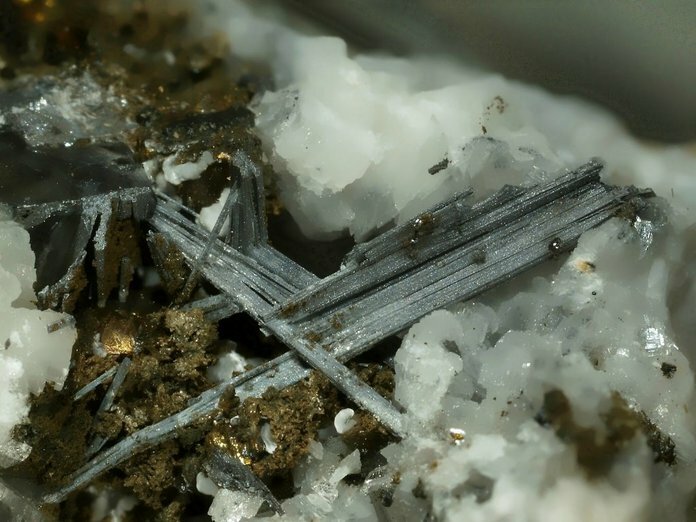 Zak, L., Megarskaya, L., Mumme, W. G. (1992) Rezbanyite from Ocna de fier (Vasko): a mixture of bismuthinite derivatives and cosalite. Neues Jahrbuch für Mineralogie, Monatshefte 1992, 69-79. [on Cu contents of cosalite]. Topa, D., & Makovicky, E. (2010) The crystal chemistry of cosalite based on new electron-microprobe data and single-crystal determinations of the structure. The Canadian Mineralogist, 48(5), 1081-1107. The following Cosalite specimens are currently listed for sale on minfind.com. Lawrence, L.J. & Markham, N.L. (1962) - A contribution to the study of the molybdenite pipes of Kingsgate, NSW, with special reference to ore mineralogy. - Proceedings of the Australasian Institute of Mining and Metallurgy, 203, 67-94. ; Karup-Møller, S. (1977). Mineralogy of some Ag-(Cu)-Pb-Bi sulphide associations. Bulletin Geological Society Denmark, 26, 41-68.
ⓘ Homeward Bound Mine ? Pring, A., Aird, W., Kolitsch, U. (2003) Perite and russellite from South Australia. Australian Journal of Mineralogy 9, 87-90. Cook, N.J., Ciobanu, C.L., Stanley, C.J., Paar, W.H., and Sundblad, K. (2007): Canadian Mineralogist 45(3), 417-435. Walter, F. & Ettinger, K. (2005): 1406) Galenobismutit, Sphalerit, Pentlandit und Cosalit von der Feldseescharte, Wurten. Pp. 290-291 in: NIEDERMAYR, G., C. AUER, F. BERNHARD, H.-P. BOJAR, F. BRANDSTÄTTER, A. ERTL, K. ETTINGER, V. M. F. HAMMER, B. LEIKAUF, W. POSTL, M. SABOR, R. SCHUSTER, R. SEEMANN & F. WALTER (2005): Neue Mineralfunde aus Österreich LIV. – Carinthia II, 195./115. : 277-315. Topa, D., Makovicky, E., Criddle, A.J., Paar, W.H., and Balić-Žunić, T. (2001) Felbertalite, Cu2Pb6Bi8S19, a new mineral species from Felbertal, Salzburg Province, Austria. European Journal of Mineralogy: 13: 961-972.; Jambor, J.L. and Roberts, A.C. (2002) New mineral names. American Mineralogist: 87: 765-768.; Kolitsch, U. (2009) 1585) Gustavit und andere Pb-Bi-Sulfosalze vom Westfeld des Scheelitbergbaues Felbertal, Salzburg. p. 207 in: Niedermayr, G. et al. (2009) Neue Mineralfunde aus Österreich LVIII. Carinthia II, 199/119, 189-236. Kolitsch, U. (2010): 1644) Azurit und Cosalit aus den Deponien des Kraftwerkbaues im hinteren Gasteinertal (Sportgastein), Salzburg. P. 231 in Niedermayr et al. (2010): Neue Mineralfunde aus Österreich LIX. Carinthia II, 200./120., 199-260. A. Strasser: Die Minerale Salzburgs (1989); Niedermayr, G. et al. 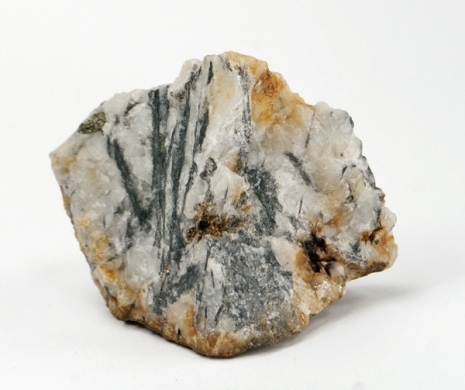 (2008): Neue Mineralfunde aus Österreich LVII. Carinthia II, 198./118., 223-274. Kolitsch , U. & Gröbner , J. (2009): 1605) Cosalit , Covellin und Markasit vom Steinbruch im Lambachgraben , Hadersdorf , Mitterdorf , Steiermark . S. 225 in: Niedermayr, G. et al. (2009) : Neue Mineralfunde aus Österreich LVIII . Kärnten II, 199/119 , 189-236 . ; Tomazic , P. (2010) : Interessante Funde von Schörl, Fluorit und weiteren Mineralien im Gneissteinbruch bei Hadersdorf im Mürztal , Steiermark . Der Steirische Mineralog , H. 24, 13-16. BRANDSTÄTTER, F. & G. NIEDERMAYR (1996): 1023. Ajoit, Cosalit und andere Mineralien aus dem Gaflunatal im Montafon, Vorarlberg. P. 138 in NIEDERMAYR, G., H.-P. BOJAR, F. BRANDSTÄTTER, V. M. F. HAMMER, B. MOSER, W. POSTL, & J. TAUCHER (1996): Neue Mineralfunde aus Österreich XLV. Carinthia II, 186./106. : 111-151. ; Kolitsch, U. (2013): 1796) Anglesit, Bismuthinit, Cerussit(? ), Diopsid, Galenit, Galenobismutit, Jarosit, Kalifeldspat, Linarit, Pyrit (Co-haltig), Pyrrhotin, Scheelit, Tetraedrit, Vesuvian(? ), gediegen Wismut und Zirkon von der Putzkammeralpe im Rindertal (Gaflunatal) im Montafon, Vorarlberg. Pp. 108-110 in Niedermayr, G. et al. (2013): Neue Mineralfunde aus Österreich LXI. Carinthia II, 203./123., 91-146. Dimitrova, D. et al. (2006): Bulgar. Acad. Sci. Annual Report No. 12, 32-33. Dobrev, S. Peculiarities of Pb–Zn Mineralization in Deposits from Yugovo Ore Field. Annual of the University of Mining and Geology “St. Ivan Rilski, 65-69. Bonev, I.K. (2007) Crystal habit of Ag-, Sb-and Bi-bearing galena from the Pb-Zn ore deposits in the Rhodope Mountains. Geochemistry, Mineralogy and Petrology, 45, 1-18. ; Bonev, I.K. (1993) Non-equilibrium highly anisometric crystals and whiskers of galena. Mineralogical Magazine, 57 (issue 387), 231-240. Kingsbury, A.W.G. and Hartley, J. (1956) Cosalite and other lead sulpho-salts at Grainsgill, Carrock Fell, Caldbeck, Cumberland. Mineralogical Magazine, vol. 31, n° 235, pp. 296-300.; Dana 7:I:446,472.; Canada Geological Survey Bulletin 280, p. 281. Minfile Number 104B 250; Rhys, D.A. (1993): Geology of the Snip mine and its relationship to the magmatic and deformational history of the Johnny Mountain area, northwestern British Columbia. The University of British Columbia, unpublished M.Sc. thesis, 1993, 278 pp. Canadian Mineralogist Vol. 16, pp, 625-640 (1978); D. C. Harris (1975) Canadian Mineralogist 13:411-414; Cerny, P., & Harris, D. C. (1978). The Tanco pegmatite at Bernic Lake, Manitoba; XI, Native elements, alloys, sulfides and sulfosalts. The Canadian Mineralogist, 16(4), 625-640. Traill, R. J. (1980) Catalog of Canadian Minerals: Revised 1980. Geological Survey of Canada Paper 80-18.; Karup-Møller, S. (1977). Mineralogy of some Ag-(Cu)-Pb-Bi sulphide associations. Bulletin Geological Society Denmark, 26, 41-68. Lei Zhang, Hanjie Wen, Chaojian Qin, Shengjiang Du, Chuanwei Zhu, Haifeng Fan, Jinrang Zhang (2015): The geological significance of Pb–Bi- and Pb–Sb-sulphosalts in the Damajianshan tungsten polymetallic deposit, Yunnan Province, China. Ore Geology Reviews 71, 203-214.; ZHANG, L., WEN, H., QIN, C., ZHU, C., & DU, S. (2014). A Study on Bi-Sb Minerals in the Damajianshan Tungsten Polymetallic Deposit and Its Geological Significance, Yunnan Province, China. Acta Geologica Sinica (English Edition), 88(s2), 946-947. Pažout, R., Sejkora, J., Šrein, V. (2017): Bismuth and bismuth–antimony sulphosalts from Kutná Hora vein Ag–Pb–Zn ore district, Czech Republic. Journal of Geosciences 62, 59-76. Litochleb, J., Šrein, V.: Chemické složení minerálů bismutu a telluru ze zlatonosných žil příbramského uranového ložiska. Acta Universitatis Carolinae – Geologica, 1989, vol. 33, no. 4, s. 511-519. Trdlička, Z., Kropáček, J., Hoffman, V.: Cosalite from Zlaté Hory (Silesia, Czechoslovakia). Acta Universitatis Carolinae – Geologica, 1973, vol. 17, nos. 1-2, s. 47-50. Karup-Møller S. (1973) A gustavite-cosalite-galena-bearing mineral suite from the cryolite deposit at Ivigtut, south Greenland. Meddelelser om Grønland: 195(5); Karup-Møller, S. (1977). Mineralogy of some Ag-(Cu)-Pb-Bi sulphide associations. Bulletin Geological Society Denmark, 26, 41-68. Scherbarth, N. L., & Spry, P. G. (2006). Mineralogical, petrological, stable isotope, and fluid inclusion characteristics of the Tuvatu gold-silver telluride deposit, Fiji: Comparisons with the Emperor deposit. Economic Geology, 101(1), 135-158.
suoperä, S. 1988. Kittilän Soretiavuoman kultapitoisten karbonaattikivien mineralogia ja muuttumisilmiöt. Erikoistutkielma, Oulun yliopisto, Geologian laitos, 31-57. Chauris, L. (2014): Minéraux de Bretagne, Les Editions du Piat, 74. Ruhlmann, F. (1978): The bismuth paragenesis in the veins of the Engelsbourg mine (Sainte-​Marie-​aux-​Mines district, Vosges, France). Bulletin de Minéralogie 101(5-6), 570-572 (in French). Guitard, G. (2010): Catalogue raisonné de la collection de minéralogie régionale, C.E.R.P. de Tautavel, 135. PIERROT R., PICOT P., FORTUNÉ J.P., TOLLON F. (1976): Inventaire minéralogique de la France n° 5, Tarn. Editions du B.R.G.M., Orléans, 117-118 pp. J. Gröbner und U. Kolitsch (2002): Neufunde von Laurion aus den Jahren 2001 und 2002. Aufschluss 53 (5-6), 363-371. Voudouris, P. C., Spry, P. G., Mavrogonatos, C., Sakellaris, G. A., Bristol, S. K., Melfos, V., & Fornadel, A. P. (2013). Bismuthinite derivatives, lillianite homologues, and bismuth sulfotellurides as indicators of gold mineralization in the Stanos shear-zone related deposit, Chalkidiki, Northern Greece. The Canadian Mineralogist, 51(1), 119-142. Vavelidis, M., Melfos, V., & Eleftheriadis, G. (1997). Mineralogy and microthermometric investigations in the Au-bearing sulphide mineralization of Palea Kavala (Macedonia, Greece). Mineral deposits: Research and exploration, where do they meet, 343-346. Szakáll, S., Fehér, B., Kristály, F. and Zajzon, N. (2012): Minerals of the Rózsa Hill ore mineralizations, Nagybörzsöny. Geoda, 22/3, 16-47 (in Hungarian). Szakáll, S., Fehér, B., Kristály, F. and Zajzon, N. (2012): A nagybörzsönyi Rózsa-hegy ércesedésének ásványai. Geoda, 22/3, 16-47. Prendergast, K. (2003). Porphyry-related hydrothermal systems in the Estberg District, Papua, Indonesia (Doctoral dissertation, James Cook University). ; Prendergast, K., Clarke, G. W., Pearson, N. J., & Harris, K. (2005). Genesis of Pyrite-Au-As-Zn-Bi-Te Zones Associated with Cu-Au Skarns: Evidence from the Big Gossan and Wanagon Gold Deposits, Ertsberg District, Papua, Indonesia. Economic Geology, 100(5), 1021-1050. O'Reilly, C., Gallagher, V., and Feely, M. (1997): Mineralium Deposita 32, 569-580. Bruno Martini collection; Bindi L., Biagioni C., Martini B., Salvetti A., Dalla Fontana G., Taronna M., Ciriotti M.E. (2016): Tavagnascoite, Bi4O4(SO4)(OH)2, a new oxy-hydroxy bismuth sulfate related to klebelsbergite. Mineralogical Magazine, Prepublication, 24 pp. (available on line since November 27, 2015). Pipino G. (2003): Oro, Miniere, Storia. Miscellanea di giacimentologia e storia mineraria italiana. Ed. Museo Storico dell'Oro Italiano, Ovada, 510 pp. Albertini, C., & Parodi, G. C. (2007). 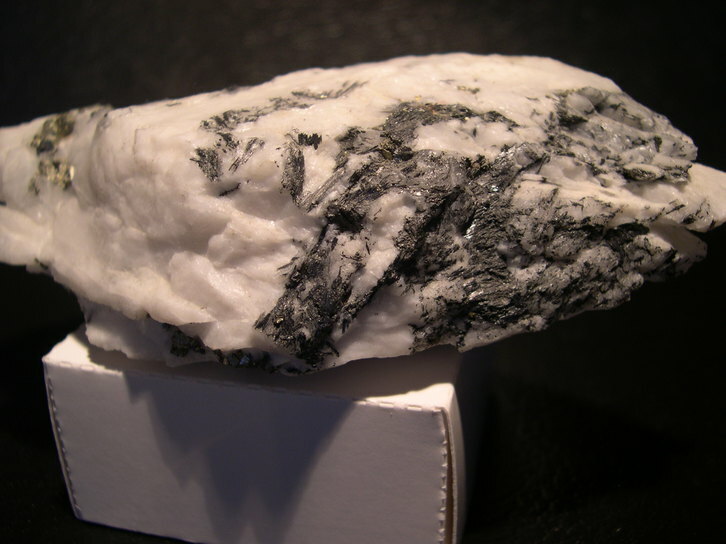 Cosalite delle cave di gneiss di Beura e Villadossola (Verbano-Cusio-Ossola). Rivista Mineralogica Italiana, 31 (2), 108-110. GARAVELLI A., LAVIANO R., VURRO F. (1997): Sublimate deposition from hydrothermal fluids at the Fossa Crater - Vulcano, Italy. - European Journal of Mineralogy - 9, 2, 423-432. Krismer, M., Vavtar, F., Tropper, P., Sartory, B. & Kaindl, R. (2011): Mineralogy, mineral chemistry and petrology of the Ag-bearing Cu-Fe-Pb-Zn sulfide mineralizations of the Pfunderer Berg (South Tyrol, Italy). Austrian Journal of Earth Sciences 104/1, 36-48. Biagioni, C., Orlandi, P. (2015) Cosalite. Miniera Montorsi, Botro ai Marmi, Campiglia Marittima (LI). In "Mineralogia sistematica. Notizie dai laboratori di analisi". Rivista Mineralogica Italiana, 39, 58-61. Bombarda, L., Granai, F., and Orlandi, P. (1999) Le cave di Val Bona e Val Pulita. Rivista Mineralogica Italiana, 23, 2 (2-1999), 100-102. Morino A., Passarino G. (2016): Minerali nel marmo di Carrara: solfuri e solfosali. Riv. Mineral. Ital., 40, 1 (1-2016), 22-33. Yamada, S. (2004) Nihonsan-koubutsu Gojuon-hairetsu Sanchi-ichiranhyou (111 pp. ); Alfredo Petrov collection. ; Shimizu, M., Kato, A., & Sakurai, K. I. (1993). Heyrovskýite, lillianite solid solution and galena from the Yakuki mine, Fukushima Prefecture, Japan. Shigen-Chishitsu, 43(240), 283-290. Yamada, S. (2004) Nihonsan-koubutsu Gojuon-hairetsu Sanchi-ichiranhyou (111 pp. ); Kato, a., & Fujiki, Y. (1969). The Occurrence of Stannoidites from the Xenothermal Ore Deposits of the Akenobe, Ikuno, and Tada Mines, Hyogo Prefecfure, and the Fukoku Mine, Kyoto Prefecture, Japan. Mineralogical Journal, 5(6), 417-433. Yokoro, Y. and Nakashima, K. (2010): Ag-Cu-Pb-Bi-S Minerals Newly Discovered from the Ohori Base Metal Deposit, Yamagata Prefecture, NE Japan: Implications for Bi-metallogenesis in the Green-Tuff Region. Resource Geology, 60, 1-17. Yuya Izumino, Kazuo Nakashima, Mariko Nagashima (2013) Makovickyite and cupromakovickyite from the Obari mine, Yamagata Prefecture, Japan. Journal of Mineralogical and Petrological Sciences, 108, #2 (April 2013), 94-100.; Izumino, Y., Nakashima, K., & Nagashima, M. (2014). Cuprobismutite group minerals (cuprobismutite, hodrušhite, kupčíkite and padĕraite), other Bi–sulfosalts and Bi–tellurides from the Obari mine, Yamagata Prefecture, Japan. Journal of Mineralogical and Petrological Sciences, 109(4), 177-190. A. E. Mourant (1985) The Identification of Two Fibrous Sulphosalts from L'etacq, Jersey. Mineralogical Magazine 49:137-138. Féraud J. (1979) - La mine " Stari-Trg " (Trepca, Yougoslavie) et ses richesses minéralogiques. Avec la collaboration de Mari D. et G. (1979) Minéraux et Fossiles, n° 59-60, p. 19-28; Kołodziejczyk, J., Pršek, J., Melfos, V., Voudouris, P. C., Maliqi, F., & Kozub-Budzyń, G. (2015). Bismuth minerals from the Stan Terg deposit (Trepça, Kosovo). Neues Jahrbuch für Mineralogie-Abhandlungen: Journal of Mineralogy and Geochemistry, 192(3), 317-333.; Kołodziejczyk, J., Pršek, J., Voudouris, P. C., & Melfos, V. (2017). Bi-sulphotellurides associated with Pb–Bi–(Sb±Ag, Cu, Fe) sulphosalts: an example from the Stan Terg deposit in Kosovo. Geologica Carpathica, 68(4), 366-381. Sangaré, A., Driouch, Y., Salvi, S., Féménias, O., Siebenaller, L., Belkasmi, M., ... & Debat, P. (2014). Géologie des minéralisations aurifères du gisement tardi-éburnéen de Kalana (Birimien, Sud-Ouest du Mali) Geology of Kalana late-eburnean gold deposit (Birimian, southwestern Mali). Bulletin de l’Institut Scientifique, Rabat, (36), 00-00. Werner, A.B.T., Sinclair, W.D., and Amey, E.B. (1998): US Geological Survey Circular 930-O. González-Partida. E., Carrillo-Chávez, A., Levresse, G., Tritlla, J., Camprubí, A., 2003. Genetic implications of fluid inclusions in skarn chimney ore, Las Animas Zn-Pb-Ag-(F) deposit, Zimapán, Mexico. Ore Geology Reviews, v. 23, p. 91-96. Ishibashi, M. (1944) Journal of the Japanese Association of Mineralogists, Petrologists and Economic Geologists, 31, 5. Serafimovski, T., Tasev, G., & Stefanova, V. (2013). Rare mineral phases related with major sulphide minerals in the Bučim porphyry copper deposit, R. Macedonia. Geologica Macedonica, 27(1), pp-43. ; Seraﬁmovski, T., Tasev, G., Strmić Palinkaš, S., Palinkaš, L.A. and Gjorgjiev, L. (2016): Porphyry Cu mineralization related to the small Tertiary volcanic intrusions in the Bučim ore deposit, Eastern Macedonia. Geologia Croatica 69, 101-119. Vogt (1886, p. 26); Neumann (1985, p. 48). Pieczka, Adam, Golebiowska, and Parafiniuk, Jan, 2009, Conditions of Formation of Polymetallic Mineralization in the Eastern Envelope of the Karkonosze Granite: The Case of Redziny, Southwestern Poland, Canadian Mineralogist, v 47, p. 765-786.; Pieczka, A., Gołębiowska, B., & Parafiniuk, J. (2011). Gold in sulfide-telluride assemblages at Rędziny, Rudawy Janowickie Range. Gold in Poland, AM Monograph, (2), 119-134. Ciobanu, C. L., Cook, N. J., Damian, F., & Damian, G. (2006). Gold scavenged by bismuth melts: An example from Alpine shear-remobilizates in the Highiş Massif, Romania. Mineralogy and Petrology, 87(3-4), 351-384. Ciobanu, C.L., Brugger, J., Cook, N.J., Mills, S.J., Elliott, P., Damian, G., Damian, F. (2014): Graţianite, MnBi2S4, a new mineral from the Bǎiţa Bihor skarn, Romania. American Mineralogist, 99, 1163-1170. ; Shimizu, M., Kato, A., Cioflica, G., Lupulescu, M., Shimizu, M. (1998): Friedrichite from Băița Bihor, Romania. Canadian Mineralogist 36, 861-868. Cook, N. J. (1997). Bismuth and bismuth–antimony sulphosalts from Neogene vein mineralisation, Baia Borşa area, Maramureş, Romania. Mineralogical Magazine, 61(3), 387-409. Gordienko, I. V., Roshchektaev, P. A., & Gorokhovsky, D. V. (2016). Oka ore district of the Eastern Sayan: Geology, structural–metallogenic zonation, genetic types of ore deposits, their geodynamic formation conditions, and outlook for development. Geology of Ore Deposits, 58(5), 361-382.; Gordienko, I. V., Roshchektaev, P. A., & Gorokhovsky, D. V. (2016). Oka ore district of the Eastern Sayan: Geology, structural–metallogenic zonation, genetic types of ore deposits, their geodynamic formation conditions, and outlook for development. Geology of Ore Deposits, 58(5), 361-382. Pekov, I. (1998) Minerals First discovered on the territory of the former Soviet Union 369p. Ocean Pictures, Moscow; Mozgova, N. N., Nenasheva, S. N., Efimov, A. V., Borodaev, Y. S., & Moëlo, Y. (1992). Wittite with Se-rich cosalite and bismuthinite from Nevskoe tin deposit (Magadan district, Russia). Mineralogy and petrology, 46(2), 137-153. Gamyanin, G. N., Vikent’eva, O. V., Prokof’ev, V. Y., & Bortnikov, N. S. (2015). Arkachan: A new gold–bismuth–siderite–sulfide type of deposits in the West Verkhoyansky tin district, Yakutia. Geology of Ore Deposits, 57(6), 465-495. Wilson, W.E. (2016) The Berezovsk District, Sverdlov Oblast, Russia. Mineralogical Record 47, 399-454.; Vikent'eva, O., & Vikentev, I. (2016, April). Occurrence modes of As, Sb, Te, Bi, Ag in sulfide assemblages of gold deposits of the Urals. In IOP Conference Series: Materials Science and Engineering (Vol. 123, No. 1, p. 012028). IOP Publishing. Timofeeva, V. S. & Borodaev, Yu. S. (1975): Minerals of the bismuthinite-aikinite series at the Bom-Gorkhon wolframite deposit (western Transbaikal). Vestnik Moskovskogo Universiteta, Seriya 4: Geologiya 30 (2), 114-117.; Eremin, O. V., Epova, E. S., Yurgenson, G. A., & Smirnova, O. K. (2014). Prognosis of Geoecological Consequences of Development of Deposits of the Bom-Gorkhon Tungsten Deposit (Transbaikalia). Chemistry for Sustainable Development, 22(2), 123-129. Dewaele, S., De Clercq, F., Hulsbosch, N., Piessens, K., Boyce, A., Burgess, R., & Muchez, P. (2016). Genesis of the vein-type tungsten mineralization at Nyakabingo (Rwanda) in the Karagwe–Ankole belt, Central Africa. Mineralium Deposita, 51(2), 283-307. Radosavljevic-Mihajlovic, A. S., Stojanovic, J. N., Dimitrijevic, R. Z. & Radosavljevic, S. A. (2007): Rare Pb-Bi sulfosalt mineralization from the Boranja orefield (Podrinje district, Serbia). Neues Jahrbuch für Mineralogie, Abhandlungen, 184, 217-224. Pršek J. & Chovan M. (2001): Hydrothemal Carbonate and Sulphide mineralization in the Late Paleozoic Phyllites (Bacúch, Nízke Tatry Mts.). Geolines 13, 27-34. Pršek J.,2004: Štruktžúra a kryštalochémia sulfosolí zo sulfidických mineralizácií Západných Karpát (Kandid. dizert. práca),Manuskript, archív Kated. miner. a petrológie PFUK Bratislava, 135 p.; - Pršek, J., Ozdín, D. & Sejkora, J. (2008): Eclarite and associated Bi sulfosalts from the Brezno-Hviezda occurrence (Nízke Tatry Mts, Slovak Republic). Neues Jahrbuch für Mineralogie - Abhandlungen, 185, 117-130. Hugi, E. (1931): Schweizer Mineralogische und Petrographische Mitteilungen 11, 163-172.
Cooper, M.P. and Stanley, C.J. (1990) Minerals of the English Lake District: Caldbeck Fells. Natural History Museum Publications, London, 160 pp. (referring to Kingsbury & Hartley). ; Cooper, M.P. and Stanley, C.J. (1991) Famous Mineral Localities: Pyromorphite Group Minerals from the Caldbeck Fells, Cumbria, England. Mineralogical Record, 22(2), 105-121. Kingsbury, A.W.G. and Hartley, J. (1956) Cosalite and other lead sulpho-salts at Grainsgill, Carrock Fell, Caldbeck, Cumberland. Mineralogical Magazine, vol. 31, n° 235, 296-300. Wirth, M. & Green, D. (2002): The Shap granite quarry, Cumbria. UK Journal of Mines & Minerals. # 22, 43-52. Geology, Radiological Age, and Metallogeny of Greenstone Complexes in the Ukrainian Shield . 33 IGC excursion No 34, July 31 - August 6, 2008; O.B.Bobrov, V.V.Sukach, M.M.Malykh, L.V.Isakov, M.A.Kozar, B.I.Malyuk (2006) Object B5. Sergiivske gold deposit. In International Field Workshop. IAGOD Field trip. Anthony, J.W., et al (1995), Mineralogy of Arizona, 3rd.ed. : 190; Graeme, R. (1981), Famous mineral localities: Bisbee, AZ, Min.Rec. : 12: 256-319. Anthony, J.W., et al (1995), Mineralogy of Arizona, 3rd.ed. : 190.
ⓘ Yankee Girl Mine ? ⓘ Memphis Mine (Roos shaft; Ross shaft [?]) ? ⓘ Nello Teer Crabtree Creek Quarry (Superior Stone Quarry; Crabtree Quarry; Nello Teer Quarry) ? Parker III,J.M,1979,Geology and mineral resources of Wake County,North Carolina,NCGS Bulletin 86,122pg. ⓘ Barite Hill Mine ?